Inspired by the Holy Scripture verse Ezekiel 4:9., “Take also unto thee wheat, and barley, and beans, and lentils, and millet, and spelt, and put them in one vessel, and make bread of it…” Ezekiel bread (made by Food for Life) is a high-protein, organic, flourless bread made with six sprouted whole grains and beans. It contains 18 amino acids – 9 of which are the essential amino acids. In the Bible, Ezekiel survived on bread made based on this same concept for two years. This bread is rich in protein and natural fiber, with no added fat or sugar. It is lower in sodium, has a much lower glycemic index score than regular bread, and will keep you full longer. You can find Ezekiel bread in the freezer section of your grocery store. At home, keep it in the freezer, then toast it to bring out the natural, nutty flavor. Use it as a healthy, low-carb, whole grain, high protein alternative. 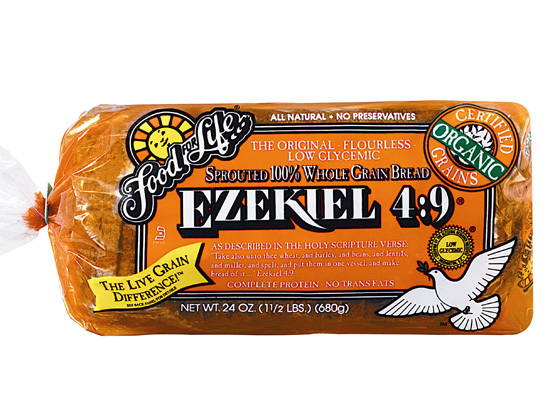 If you can’t live without toast in the morning or a sandwich at lunch, I encourage you to try out Ezekiel bread.